When we were in fourth grade, at recess, a "big kid" whacked me for some reason. In a flash, Patrick - who was NOT a "big kid" shoved him away and said "You don't hit girls"
Probably today we'd all be expelled or have to get counselling, but the incident for me was as if a knight in shing armor had suddenly come to my rescue. Pat was in a few of my classes and one I remember in particular was a math class with Mr. Barker. Pat often made the class bearable, and usually had me in stitches with his brand of humor. Although some of his cracks might have disrupted the class occasionally, by the look on his face, I think even Mr Barker thought Pat was a funny kid. I had not seen Patrick in a long time. Phil lives outside of Seattle and we went to see him back in 2010 when we were out there attending my brother Kevin FitzGerald's graduation from the PA program at the University. Pat was married and had kids but got divorced. We were in the Army together and went to Vietnam together. After we got out of the Army he drifted off. Pat, David Tocci and I were pretty tight. We did a lot of motorcycling together. I try to remeber the good times we had and the laughs. 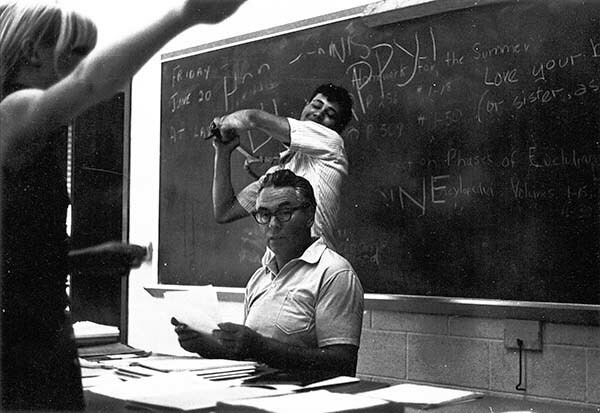 Here's a shot I took of Pat in the math class with Mr. Barker. All staged of course. My sister reminded me Pat had worked with her and others in the kitchen of Glover hospital. He was a quiet but very funny guy.